Lodi and Lake Wisconsin have a lot to offer the vacationer. It provides excellent fishing, the opportunity to participate in all water and winter sports, and some scenery almost without parallel in the Midwest. Ice Age Trail Map - To see a regional overview map of Ice Age Trail segments in this area and driving directions and descriptions of each segment. Devil's Lake Trail Map - Hiking and biking trail map. Mackenzie Center Map - Environmental education center operated by the Wisconsin Department of Natural Resources near Poynette, Wisconsin. Ice Age Trail Snowshoeing - The Ice Age Trail is one of only eleven National Scenic Trails in the United States. This thousand-mile footpath highlights Wisconsin’s world-renowned Ice Age heritage and scenic beauty. The Trail meanders through 31 counties and is within 15 miles of nearly two million Wisconsin residents. For information about the Ice Age Trail Alliance go to www.iceagetrail.org or call 1-800-227-0046. Lodi Area XC Ski Club Trails - The trailhead is located on the corner of Vilas Hibbard Pkwy and Strangeway Ave at the Lakeland Hills Country Golf Course. A parking lot is routinely plowed near the storage sheds; road parking is also allowed. Depending on conditions and weather, an 8 km trail will be groomed regularly. Polaris Snowmobile Trail Mobile App - View your location, road maps and weather conditions. Search for food, gas and Polaris dealers and more. Lodi & Lake Wisconsin Map - Map of the Lodi & Lake Wisconsin Area. Download the whole map here. 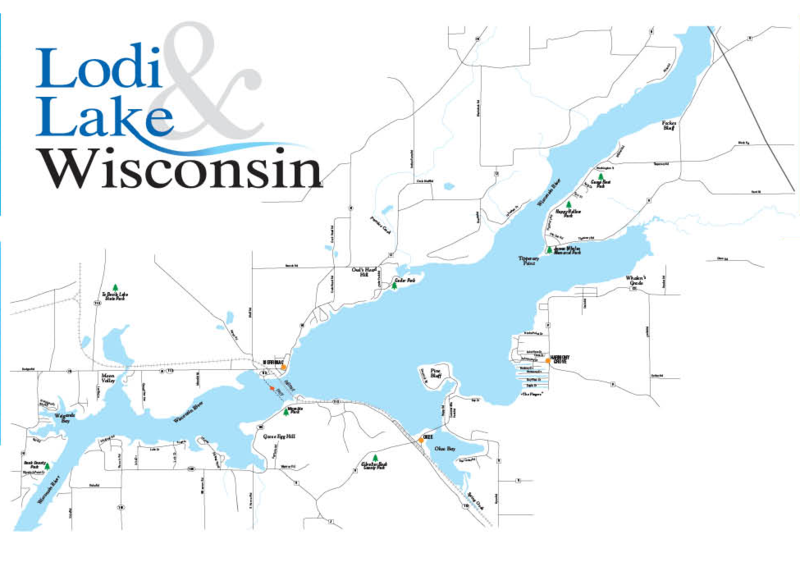 Lake Wisconsin Map - Businesses and points of interest on and around Lake Wisconsin. Lake Wisconsin Navigation Map - Map to help you navigate the 10,000 acres of Lake Wisconsin. Thanks to Alliant Energy for their graphics.